Hiring Managers – are you tired of re-screening every candidate a recruiter sends you? We have a solution that’s great for you and great for candidates. Recruiters phone screen candidates as they normally do. Recruiters ask the role-specific questions that you normally ask. 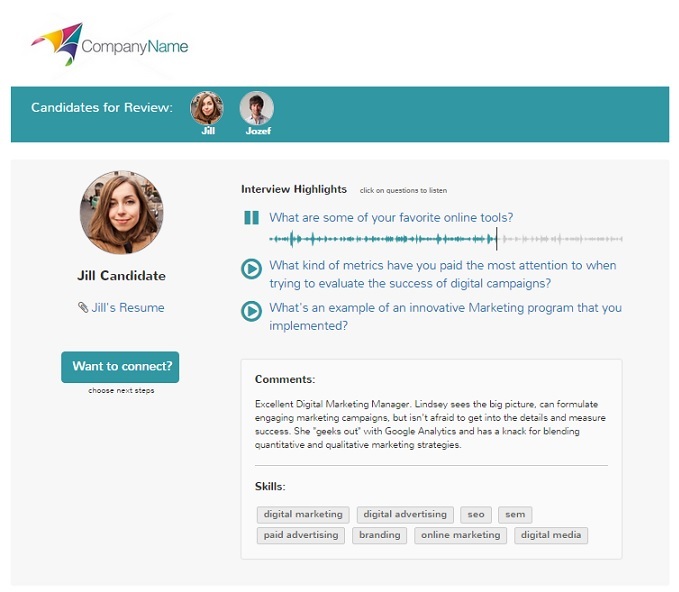 Recruiters capture real-time audio excerpts of the candidate’s answers. You allocate 30 seconds, instead of another 30 minutes – to listen to a few highlights and quickly get to know a candidate’s domain experience, communication style and personality. Imagine 10 extra hours per week and cutting two, three, even four steps from your hiring process, in order to expedite the best candidates and to get them offers before the competition. The only question is.. What will you do with all the extra time you have? After years in the hyper-competitive NYC and SF talent markets, I’ve discovered that an efficient hiring process is a competitive advantage and speaks volumes about what it’s like to work for your organization. Learn more or start using Real-time Phone Interview Software today.